Jiggles saw a few other mice running around in the garden, looking for their favorite. 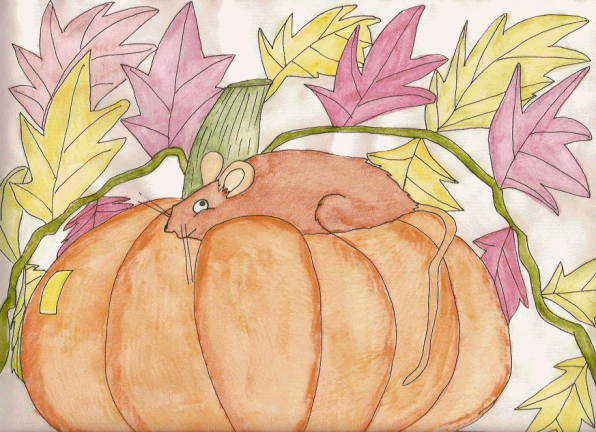 He didn't want any of the other mice to claim his pumpkin, so he stayed at the pumpkin to guard it from all the other mice. He climbed up on top and snuggled in between the cracks and bumps. “Guarding it. You see, this is my pumpkin. It's the biggest in the whole pumpkin patch and I want it for myself. If I leave, then some of the other mice might come along and claim it as their own.” Jiggles explained things to the crow. “I'll watch it for you. I'll stand right here and guard it while you run along and find something to eat and drink. I'm sure your tummy is growling with hunger pains,” the crow said. Jiggles thought about it. “All right. If you'll guard it for me, I'll go and find something to eat. Thank you.” Jiggles ran off. The crow, being a tricky old bird, waited until Jiggles was gone and then pecked at the pumpkin. “This is delicious.” He let out a loud caw and several more crows flew down. They gobbled up the pumpkin, even all the seeds inside of it too. When they'd finished, they flew away, leaving nothing but the stem. Jiggles had no choice but to look for another pumpkin. He ran all through the patch, but every pumpkin that he saw was already claimed by another mouse. “Jiggles, there is one pumpkin left. You can have it,” one of the mice said, giggling. Every year from then on, Jiggles didn't try to get the biggest pumpkin in the patch. He was content having a middle-sized one and the crows never bothered him again.